Members of India's Ladakh Scouts infantry regiment survey a mountain pass in the Ladakh Range of the Himalayas in the Jammu and Kashmir region of India. Afghanistan: Can Obama Sell America on This War? The road to success for President Obama's Afghanistan strategy runs through India, goes an increasingly familiar refrain. That's because reversing the Taliban's momentum requires getting rid of the movement's sanctuary in Pakistan, where the insurgent leadership is known to be based in and around the city of Quetta. But while Pakistan is aggressively tackling its domestic Taliban, it has consistently declined to act against Afghan Taliban groups based on its soil  because it sees the Afghan Taliban as a useful counterweight to what it believes is the dominant influence in today's Afghanistan of Pakistan's arch-enemy, India. Unless India can be persuaded to take steps to ease tensions with Pakistan, some suggest, Pakistan will not be willing to shut down the Afghan Taliban. Needless to say, that argument is not exactly conventional wisdom in New Delhi. Indian influence has expanded after the U.S. invaded Afghanistan in 2001 and toppled the Taliban  it had been a longtime supporter of the Northern Alliance, the anti-Taliban coalition that dominated the Karzai government, and it poured hundreds of millions of dollars of aid into supporting the new regime. That's left many in Pakistan raising the specter of Indian encirclement  a concern noted by U.S. General Stanley McChrystal in September, when he said that "increasing Indian influence in Afghanistan is likely to exacerbate regional tensions." Some U.S. pundits have even called for India to scale back its operations in order to appease the Pakistanis. Indian officials have little time for such reasoning. Events northwest of the Khyber Pass have had a central place in the strategic calculations of generations of rulers in Delhi, dating back to the imperial Mughals and the colonial British. India's ties with Kabul had lapsed during the bloody civil war that saw the Pakistani-backed Taliban rise to power in 1996, turning Afghanistan into a hotbed of extremism, some of it directed against India. In 1999, an Indian passenger airliner was hijacked by Pakistani nationals and flown to Afghanistan  negotiating for the release of the hostages, India was forced to free three Islamist militants, one of whom was later implicated in the killing of American journalist Daniel Pearl in Pakistan. The Taliban also forged links with fundamentalist groups waging war on India in the disputed territory of Kashmir. "The consequences of that vacuum where Pakistan stepped in and meddled were horrendous for India," says Harsh Pant, professor of defence studies at King's College London. "It's a lesson no one in India is in the mood to learn again." That's why India has pumped over $1.2 billion in development aid to the Karzai government, funding infrastructure projects ranging from highways to hydroelectric dams to a 5,000-ton cold storage facility for fruit merchants in Kandahar. India is building schools and hospitals, as well as flying hundreds of Afghan medical students to train in Indian colleges, because its own experience of the last period of Taliban rule has given it a vested interest in preventing a recurrence. The popularity of Bollywood music and Indian soap operas also hints at India's significant cultural influence in Afghanistan, which is buttressed by lasting bonds with Afghanistan's political elite. Afghan President Hamid Karzai went to university in India, while his electoral opponent, Dr. Abdullah Abdullah, belongs to the old Indian-backed Northern Alliance. Kabul and New Delhi also share a common distrust of Islamabad, seeing the 1996 Taliban takeover as having been enabled by Pakistan's military intelligence wing. But in the India-Pakistan relationship, each side often thinks itself the victim of the other's machinations, and Pakistan's generals view India's growing influence in Afghanistan as motivated by an intent to destabilize Pakistan. In recent months, officials in Islamabad have claimed that India's consulates in the Afghan cities of Kandahar and Jalalabad have been orchestrating terrorist activity in Pakistan, particularly in the vast, restive province of Baluchistan. India vehemently rejects such claims, for which no evidence has been offered in public. During her trip to Pakistan last month, U.S. Secretary of State Hillary Clinton also dismissed the notion that India was trying to foment trouble in Pakistan. "The Pakistani fears are completely imaginary," says Bahukutumbi Raman, a former top-ranking Indian intelligence official and prominent strategic analyst. The problem for Washington, at least according to Raman and other Indian analysts, is that regardless of their validity, Pakistan's fears translate into inaction when it comes to tackling the Afghan Taliban on its soil. "[The Afghan Taliban] are important to the Pakistanis. They give them a strategic depth," says Raman. Commodore Uday Bhaskar, director of the National Maritime Foundation, a think-tank attached to the Indian navy, says the Pakistani military is still struggling to accept a strategic universe in which India is no longer its most dangerous enemy. "You get the sense that if [India] does not loom large as a threat, then the Pakistani military loses much of its raison d'etre as an institution," says Bhaskar. Indian analysts fear tensions could be exacerbated by President Obama's declaration that the U.S. will begin to draw down 18 months after surging some 30,000 more American troops into Afghanistan. "It makes political sense for Obama, but the decision has really set the cat amongst the pigeons in the region," says Bhaskar. "Everyone is rattled." The prospect that the U.S. will soon depart Afghanistan makes it even less likely that Pakistan will want to crack down on a group that could still be a strategic asset in an uncertain situation. 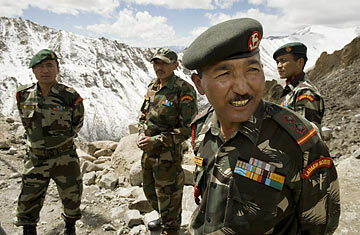 India, for its part, is unlikely to change its own strategy in Afghanistan. It is developing a port at Chabahar in Iran, which could become a key point of entry for Indian goods and materiel into Afghanistan because Pakistan refuses India land transit rights to the Afghan border. India also runs an air base at Farkhor in Tajikistan on Afghanistan's northeastern border  a facility it secured with Russian support. Neither Moscow nor Tehran want to see the Taliban return to power, and a growing consensus between Russia, Iran and India  all traditional backers of the Northern Alliance  could work to prevent that in the months and years to come. "India may have to hedge its bets with these regional partners," says Harsh Pant. "When America leaves Afghanistan, they may be the ones left to deal with the mess." Read "Pakistan's Reaction to Obama's Plan: Departure Is Key"
See pictures of Pakistan's vulnerable North-West Frontier Province.